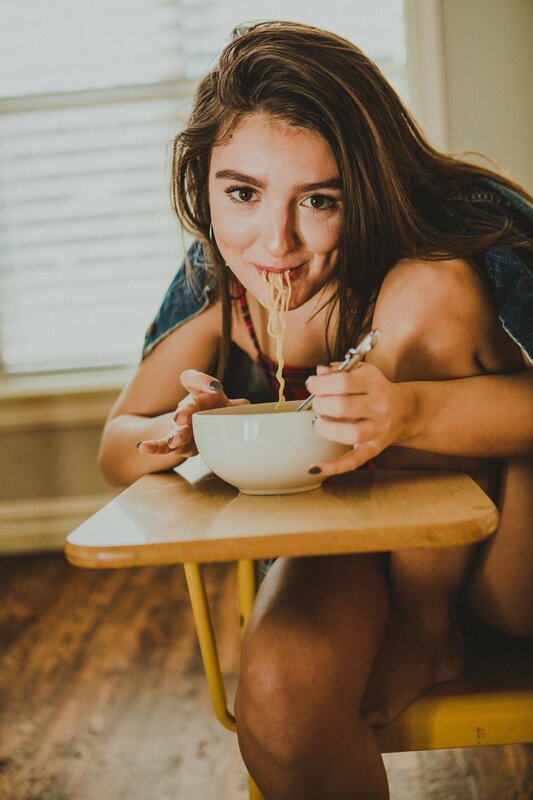 What do you say when your daughter texts you a screenshot of an album cover she loves depicting a girl eating ramen noodles and asks you, " Can we do a ramen noodle photoshoot?". You say, "Absolutely?!". Gentry loves ramen noodles! She eats them by the case. So when she saw Stella Donnelly's album cover for her EP Thrush Metal, she was super inspired and excited! So, of course I obliged! Here are some of the images from that day!! Who's taking your senior pictures? Back in 2015, I was really looking improve my skills and repertoire for my growing senior photography business. Having had three girls who were growing up in this community, a lot of local seniors started to follow me on instagram and I usually followed back. In this business, it's important to keep up with high school seniors interests and various esthetics. I kept noticing a lot of local seniors were tagging a guy named Don Nixon in their senior photos. Not just typical senior photos, but fashion inspired senior photos. I loved them and started to really look into this guy named Don. I clicked his name on a post and found out that Don was not only an awesome photographer, but Don was a senior too! I was so thrilled that someone so young would have such an amazing eye and a fashion edge. I was seeing Don's post photos he had taken at a studio space using lighting and backdrops. I was so jealous! I had NO idea how to use studio lights and felt overwhelmed with the prospect. Well, on May, 4, 2015, I had the bright idea of private messaging Don and asking him, "Who is taking YOUR senior pictures?" I told him I wanted to edge up my style and would love to work with him. I asked if we could trade out our skills and maybe collaborate on something. As luck would have it, Don was just as excited as I was!! And that is where it all began! We met at the studio space and I brought my girls to be our models. I watched and learned from Don. He seemed so confident with the technical aspects of photography that I totally struggled with having been self taught. I'm pretty sure Don was self-taught too, but I never saw him fumble or struggle with his camera like I seemed to do. Here are a few of my favorite images from that day. Side-note: Don had just pierced his nose before this, and I'm pretty sure he hated it (it came out soon after these photos). I'm not sure if he ever showed any of these photos to anyone. Hahaha! We both got some great shots that day. This is such a special memory for me because this was JUST the beginning of a long-lasting friendship, as well as a professional relationship that is still going strong almost three years later! Back then in 2015, Don dreamed about moving to New York to pursue a career as a fashion photographer. No easy task for anyone, especially a guy who just graduated high school. I knew then he would make it big someday, so I really encouraged him to follow his dreams. Don and I started working together. He assisted me on some sessions and became my editor. I kept him busy editing and he also worked really hard developing his own style and continually shooting models and friends to build his portfolio. He saved all of the money he made editing and assisting, and before you know it, he was off following his dream! Don moved to New York a year ago. He is doing some incredible work! I could not be more proud. Check out his website and and follow him on instagram! His work is stunning and so creative! Don Nixon will be famous. I guarantee it! Puppy dog sniffs were a special part of our bedtime routine.